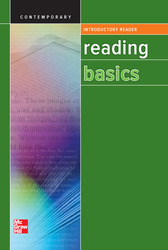 Contemporary's Reading Basics: A Real World Approach to Literacy is built on current, evidence-based research in adult reading. The program helps adult learners improve their skills in each of the four components of reading: alphabetics (phonemic awareness and word analysis), fluency, vocabulary development, and comprehension. Reading skills are aligned to TABE. The program consists of Student Edition workbooks and Readers; each unit in the Student Edition relates to the corresponding unit in the Reader by reading level and reading skills.